This simple massage is a really effective way for you to soothe and tone your skin. 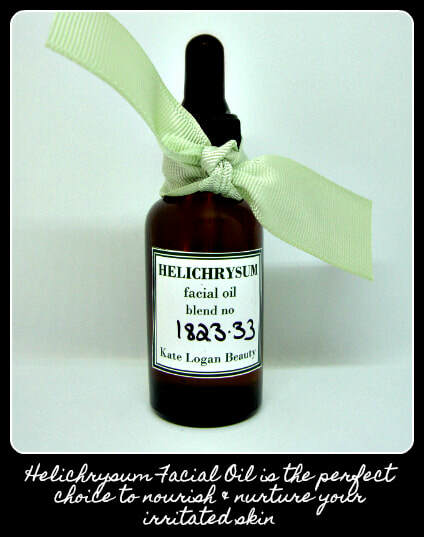 It also helps you get the very best result from your facial oil. It's a simple synergistic blend of massage and acupressure movements. This treatment will stimulate your circulation and kick start cell regeneration ensuring your skin has a fresh, rosy glow. Don't be put off by the instructions (you must know by now that I do have a tendency to ramble on! ), it takes longer to read than actually do! Allow your hands to mirror each other in a gentle, unhurried way. Using the thumb & index finger of each hand; start at the inner edge of eyebrows & pinch gently, working outwards towards your ears. Pinch along till you reach the end of your brows. Do this action twice. Using same pinching action move hands down to centre of chin and work along jaw to ears. Place palms on your jaw with fingertips resting on cheekbones at each side of nose. With a light sweeping touch, smooth the fingertips up by the sides of the nose, middle of forehead, then down towards temples and back to jawline. Do this action twice. Place the flat pad of you ring finger on the inner edge of eyebrow. Using the underlying bone as a guide; start at the inner eyebrow & with a smoothing action work outwards, around cheekbones & back to the top of nose. Do this action twice. With the fingertips of each hand touching at the centre of the forehead (arms raised, elbows out) smooth outwards towards temple. Do this action twice. With fingertips on temples slowly work in circular motion. Spend a moment just enjoying this relaxing action. With fingertips at both sides of nostril and using cheekbone as your guide use a comfortable pressure to sweep fingertips upwards towards ears. Do this action twice. With flat pad of fingers use small gentle circular motions around the face & neck (but avoid delicate eye area). Then with a gentle tapping action (like tapping a keyboard, but quicker!) use the pads of your fingers to tap all around face & neck. Gently tap eye area (working outwards towards ears) it’s a great depuffing trick! Alternate these two moves for about a minute or so. With the back of one hand gently pat under your chin. Repeat this action about 20 times or so. Simply repeat steps one & two. Then starting at top of ears, using thumb and index finger pinch around your ear working all the way down to your lobe. This is a lovely way to finish the massage as all the reflexology points that are on your tootsies are also present on the ear lobe, so this simple action will refresh and restore.